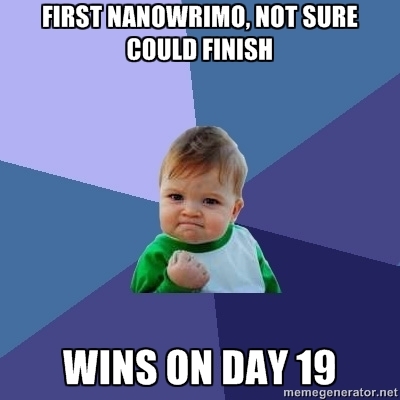 As followers of my facebook page would know, on Monday I hit the legendary 50,000 words in my NaNoWriMo novel. As awesome as that is, in my plotting I projected the novel would actually be 100,000 to 120,000 long, typical epic fantasy stand-alone length, so I’m barely half way through, so I’ve got to keep up the momentum. 3 – The feeling when you write a sentence that sings, and you didn’t even try! 5 – Creating characters and making all their scars, complexities, dreams and fears, even though I don’t get to share it all with the reader – those bits are my little secret *Cheshire cat-style grin*. 10 – Having an awesome excuse to research fun things (like medieval inventions and Greek mythology) and calling it work. I couldn’t quite come up with ten dislikes. Oh well, a good sign I guess. Any you agree/disagree with? Anything you might add? Are there ten pros and cons for your dream job? Your amazing Kirsty! I wish I had your passion and dedication to write! This is definitely my top thing I hate about writing, too. It is very frustrating never having the time to get all the stories written. I sometimes look at all my ideas and I know there is no way I’ll ever get to write all of them, even if I do live to a ripe old age. The thought disheartens me because I have to choose what idea to work on next, thus rejecting all these other ones. It’s like when you have to fire an employee you get along with great personally, but who has no work ethic – you have no choice in the matter, but you feel like you’re knifing a friend in the back(you can probably tell I’ve had to fire a few friends from reading that).